Bolinksy to Foney on a 49-yard completion. 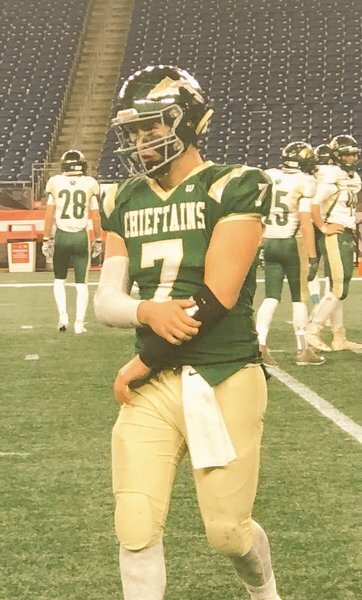 The Nashoba QB is over 200 yards today. Nashoba has 3rd and goal at the 2 and D-R pushes back. Fourth down. 19-yard field goal by Childs is good. Nashoba leads 19-0 with 5:45 in the third quarter. Nashoba recovers a fumble at D-R 49. Dighton-Rehoboth stops Nashoba RB Alex Childs just short of the goal line as they limit Nashoba to a FG, Nashoba leads 17-0 with 5:37 left in the third. Barksdale is a jack-of-all-trades today. Barksdale just tossed a 36-yard halfback pass to Danby. Kick is good, 24-0 Nashoba, 3:02 left in 3Q. The @DRHighSchool mascot looks unamused as Sam Bolinsky throws his second TD pass of the game. @nashobaAD leads 24-0 with under 2 min left in the 3rd quarter. END THIRD QUARTER: Nashoba 24, Dighton-Rehoboth 0. Chieftains are 10 minutes away from their second state title in the last four seasons. Harrison Pray's pass falls incomplete on 3rd and 9 and D-R punts again. Childs in from 8 yards out and he makes the extra point. 31-0 Nashoba with 1:02 left in the game. Childs in from 8 yards out and he makes the extra point. 31-0 Nashoba with 2:02 left in the game. 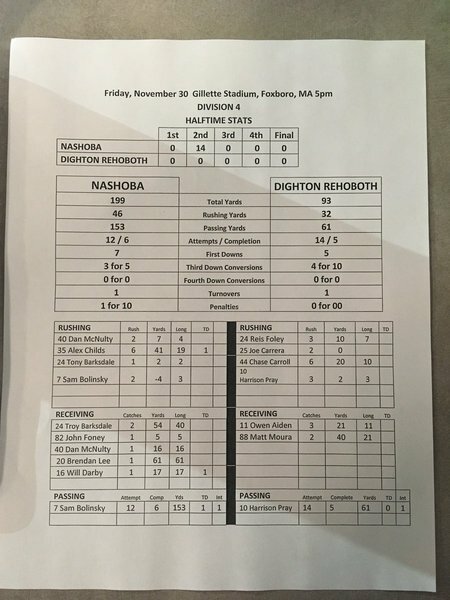 D4 State Final: Nashoba 31, Dighton-Rehoboth 0. Nashoba's Evan Doig comes up with an interception at the goal line, runs it to the 10 and that's it. Bolinsky takes a knee and Nashoba wins 31-0 to win the Division 4 Super Bowl. What: Division 2 Super Bowl. Coaches: North Andover — John Dubzinski (fourth season, 53-35); King Philip — Brian Lee (14th season, 97-16). Scoring: North Andover — 38.5 ppg; King Philip — 20.7 ppg. Defense: North Andover — 11.3 ppg; King Philip — 10.6 ppg. The heavies up front: North Andover — Raphael Usuomon (6-3, 250); King Philip — Nolan Gunning (6-4, 250). 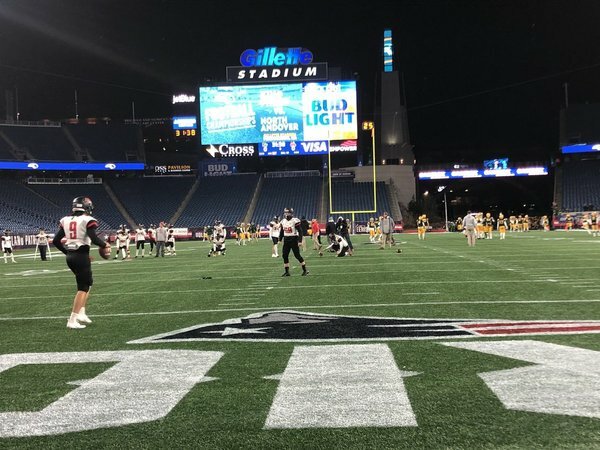 Stat check: The North Andover quartet of senior quarterback Jake McElroy, senior wideouts Gabe DeSouza and Darren Watson, and junior running back Freddy Gabin has fueled one of the top-scoring attacks in the state. The four have combined for 62 touchdowns this season. 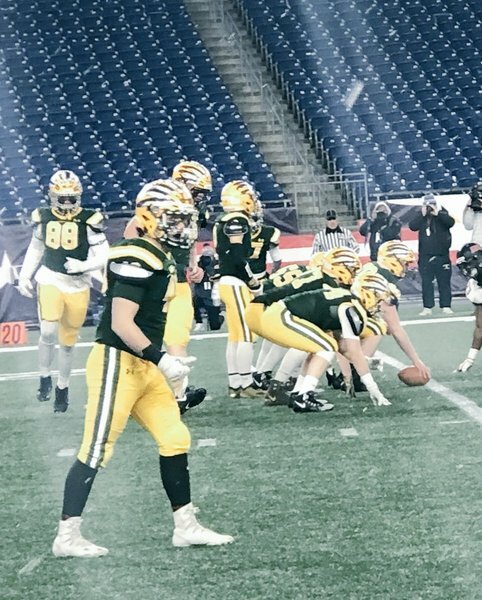 The key component behind King Philip’s back-to-back state championships is defense. KP is back at Gillette looking for the three-peat and will rely heavily on junior Ryan Halliday on both sides of the ball. The captains: North Andover — RB/S Darren Watson (Sr.), QB/S Jake McElroy (Sr.), TE/LB Ryan Slattery (Sr.), WR/S/K Gabe DeSouza (Sr.), C/LB Matthew Samenuk (Sr.); King Philip — LB Jack Webster (Sr.), RB Conor Galvin(Sr.), WR David Morganelli (Sr.). 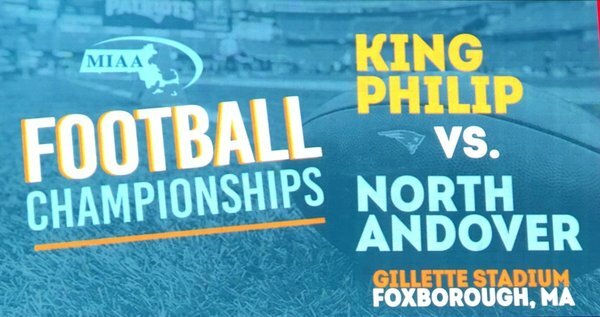 Seniors on the roster: North Andover — 20; King Philip — 25. 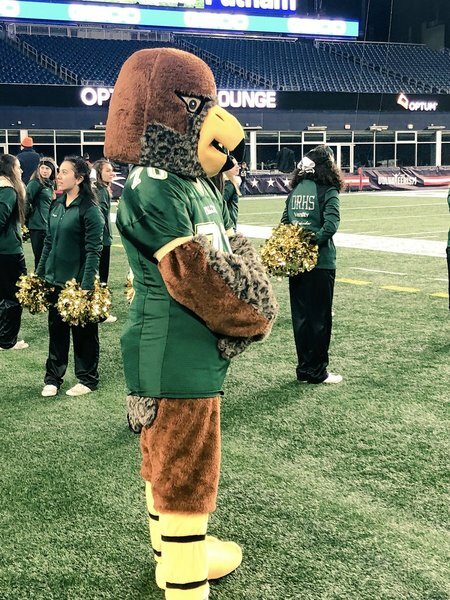 Last Bowl appearance: North Andover — 1996; King Philip — 2017. The Warriors have leaned on their defense time and time again. Still featuring one of the top units in the state, KP runs into a Scarlet Knight team that has been on a mission since Week 1. North Andover is explosive, so KP will face its stiffest test of the three bowls. It could be a long game if the Warriors can’t control the clock. Defense wins championships, right? And it certainly will Friday night — along with a high-flying offense. The Scarlet Knights have been just as explosive on the defensive side of the ball throughout the year, and that will again spill over to their offensive attack. 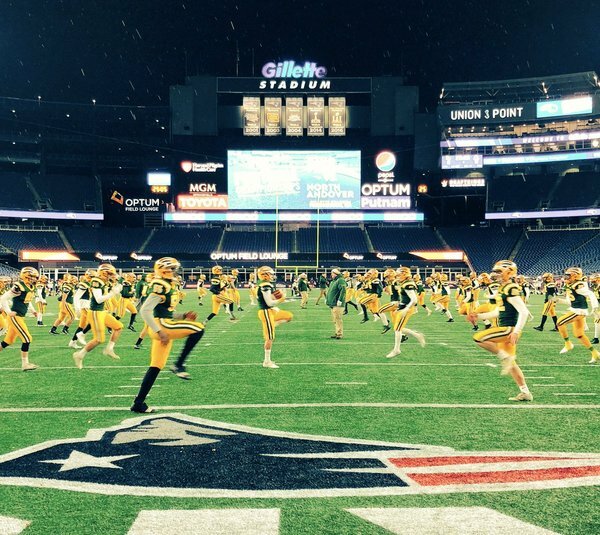 North Andover (11-0) and King Philip (9-2) warming up for the D2 Super Bowl. KP seeking a third straight title but face an absolute juggernaut in NA, which is scoring 38.5 PPG and allowing just 11.3 PPG this year. North Andover won the toss, chose to defer to the second half. 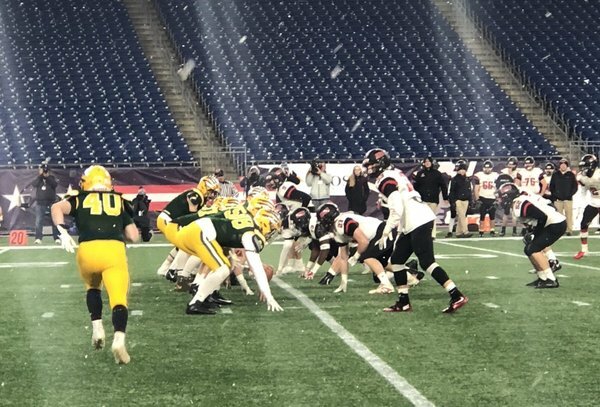 King Phillip High School starts off the 2018 MIAA Division 2 State Championship vs North Andover from their own 24 yard line as the snow continues to fall at Gillette Stadium. 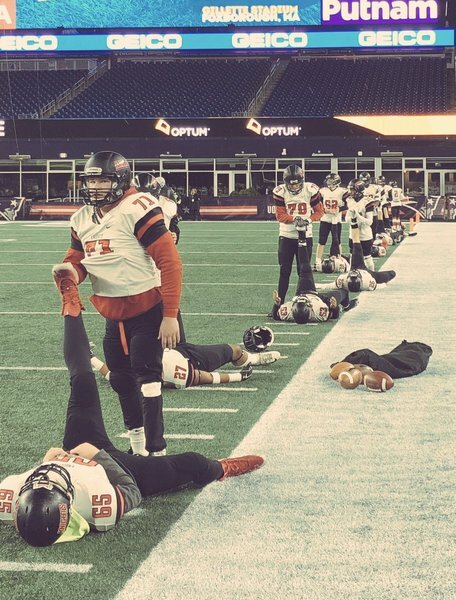 King Phillips unsuccessfully attempts a fake field goal deep in North Andover territory. It’s 0-0 with 1:12 left in the first quarter. Senior QB, Jake McElroy, throws a interception into the King Phillip end zone game to end what had been an impressive drive for North Andover. It’s 0-0 with 4 min left in the 1st half. McElroy denied on 3rd down, but gets the push he needs on 4th and goal for a 1-yard TD. XP blocked. Halftime: North Andover 6, King Philip 0. Lowest first half scoring output from NA this season.